Janitorial Service & Cleaning Dallas, TX | Courtesy Building Services Inc.
We understand that before you enlist our services, you want to know how much the job will cost you first. This is why we offer a free estimate. All you need to do is just fill out our no obligation form below. Through the information you will provide, it will help understand your facilities better before we visit your premises to provide a personalized service estimate. Typically, every inquiry is followed up within 1 to 2 business days of receipt of request. If you need faster service, you can call at 1 800-479-3853 (toll- free) from Monday through Friday between 8:30 am and 5:00 pm. 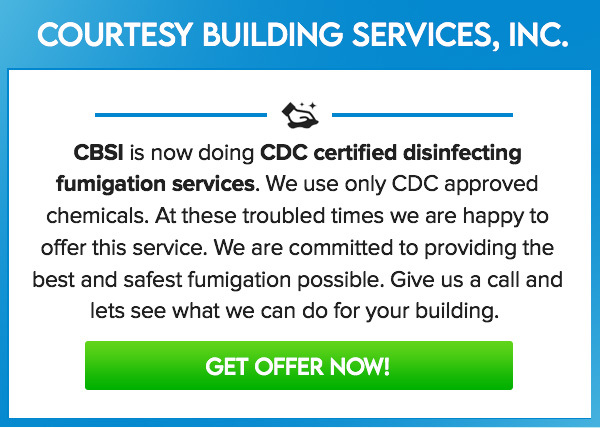 Please fill out the form provided below to get a free estimate from Courtesy Building Services, Inc.
To obtain a FREE estimate from us, Please fill out the form below. Aprox. size of the office area in SQ. FT. to clean ?